Shenzhen is a city of immigrants and has cuisines from all parts of China and the world. Being a seaside city also means it has good fresh seafood. Shenzhen is a foodie’s paradise. Much information is available on the internet about dining in Shenzhen. See for example, this page. We focus below on dining options within walking distance from the GT-Shenzhen office. 高新科技园区职工食堂 (High Tech Industry Park Staff Cafeteria) is just across the street from the Shenzhen Virtual University Park (SZVUP) building. It is a large food court serving breakfast, lunch and dinner at economical prices. You can pay cash but in order not to hold up the people behind you, get a prepaid card for this cafeteria so checking out during rush hour can be a breeze. 六千馆 (Liu Qian Restaurant) is just a few steps away from the SZVUP building. It has an excellent menu at reasonable prices. Lunch is served cafeteria style at low prices. Lines are long M-F at peak lunch and dinner hours. Try to beat the rush by going there a bit earlier. You can pay cash but in order not to hold up the people behind you, get a prepaid card for this restaurant so checking out during rush hour can be a breeze. Nearby the GT-Shenzhen office you can also find KFC, Starbucks, Yoshinoya, McDonald’s and other eateries. If you are willing to walk a little, or if you are studying in the Shenzhen University Library anyways, you can try one of the cafeterias on the Shenzhen University campus. Not all on-campus cafeterias accept cash-paying customers, but some do. First purchase a voucher/ticket from the cafeteria (usually from a lady sitting at a table). Each voucher is 10 RMB (unfortunately this seems to be the only denomination they have for vouchers). You then give the voucher(s) to a server at a station, and point to the dishes that you want. The server will give you the appropriate portions to add up to the face value of the voucher(s). If you go with another student, you can split a couple of vouchers between the two of you and one may get a little more and the other a little less. Most meat dishes cost 4.50 RMB, most meat + veggie dishes cost 3.50 RMB, most veggie dishes cost 1.50 RMB. This is probably your most economical dining option in Shenzhen. 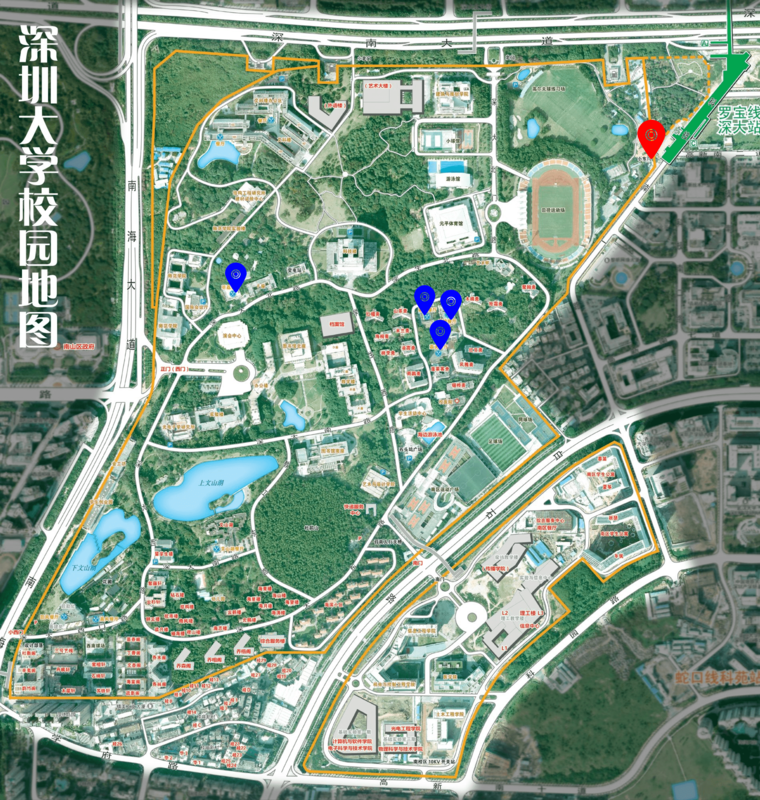 To go from the SZVUP (highlighted with a yellow oval in the map below) to the cafeterias on Shenzhen University east campus, proceed in the direction of the metro station “Shenzhen University”. 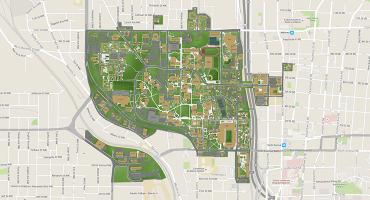 There is a Shenzhen University “Little East Gate” (highlighted with a red oval in the map below) west of the metro station. 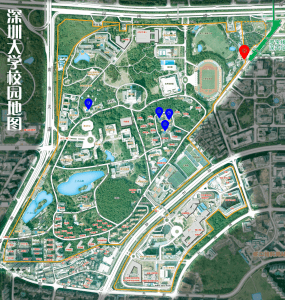 Once you are inside the Shenzhen University campus, use the map below to guide you to a cafeteria (four cafeterias in the east campus area are highlighted with blue ovals in the map below). You can also bike (~10 mins) or take metro to a shopping mall named Mixc World 万象天地(Line#1, Hi-Tech Park station) which is only one metro station away from SZVUP. Mixc World has many cafes, food courts and fine dining.